LASIK can perfect vision to some of the highest human levels, and scientists have used some lessons we've learned from eagles' eyes to get us there. Katie is the Director of Hunter Vision's Community Outreach. If you think that role hasn't played an influence in your life, well, you may be right; you also may be wrong, though, and the way to tell the difference is if you've ever seen a Hunter Vision booth in your life. Many times a week, and at some points, many times a day, there are kind people from Hunter Vision handing out bananas, or snow cones, or coffee at different community events in Orlando and answering people's questions about LASIK or laser vision correction in general. She's wonderful. But that's not the point of this blog. The point is to answer a question that her husband Joe asked me. He is also a fine example of a human being, but I'd better move on to talking about vision before this blog hits a critical level of digression. Joe asked why it is that eagles have the ability to see so much better than humans. It's a great question. You may have heard a factoid at some point that eagles have 20/2 vision (that's not a typo), and that it correlates to something similar to reading the date on a quarter from across a football field. You may have heard it from me, at a party we were at, right before you found a polite excuse to end our conversation so that you could go talk to someone interesting. 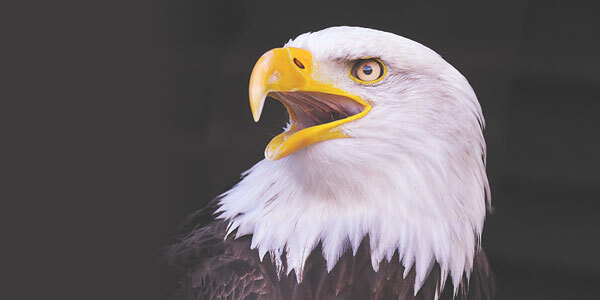 Either way, the truth is that eagles, and birds of prey in general, have among the most impressive eyes on earth. There are two main reasons for this, and one of them actually has something to do with 3D LASIK. The eye is like a camera, and because of that, two of the biggest influences on sharpness of vision are the quality of the lens and the quality of the film on which the image is focused (See? Just like a camera!). The "film" inside the eye, whether in an eagle or a human, is called the retina. How small or fine an image may still be discernible is determined by how close together the light sensors (cells called photoreceptors) are packed. In an analogous way, it's a lot like what determines how high the definition or how sharp the image is on an iPhone screen, or TV screen. The more tiny pixels that are covering the same amount of space, the better the image will be. In this analogy, an eagle's retina would be like an iPhone's Retina display (well, that analogy worked out better than expected) and our human retina would be like the display on one of those old indestructible Nokia phones that only had one game, that was called "Snake." The other reason has to do with the quality of the lens. The lens on the front of the eye is called the cornea. When a cornea is flat in the center (a 3D geometric shape called "oblate"), it has poor fine focus. When a cornea is steeper in the center (this is called "prolate") it offers higher resolution. Eagle corneas are hyper-prolate. They were built to see a very tiny zone of very high definition. When you hear about vision side effects of LASIK from 10 years ago, almost always it has to do with the laser making the cornea more flat in the center than it should be. A flat, oblate cornea will have a much higher chance of bad night vision, poor contrast sensitivity, and regression toward it's old glasses prescription. Part of 3D LASIK is that we use a Wavelight laser that was specifically designed by some very smart German engineers to better keep the natural prolate, steeper-in-the-center, shape of the cornea. So while eagles see better than we do because they have a better retina, they've never built a laser that can shape the cornea to correct vision like humans have. So we've got that going for us, which is nice.